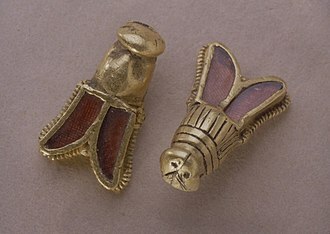 The Franks were originally led by dukes (military leaders) and reguli (petty kings). The Salian Merovingians rose to dominance among the Franks and conquered most of Roman Gaul. They also conquered the Gaulish territory of the Visigothic Kingdom in 507. The sons of Clovis conquered the Burgundians and Alamanni. They acquired Provence and made the Bavarii and Thuringii their clients. The Merovingians were later replaced by a new dynasty called the Carolingians in the 8th century. 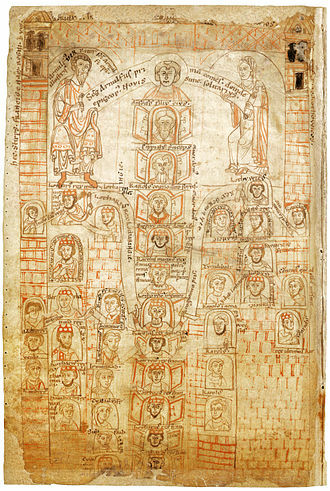 By the end of the 9th century, the Carolingians themselves were replaced throughout much of their realm by other dynasties. 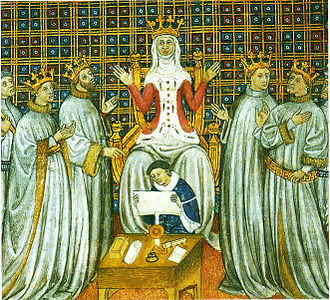 The idea of a "King of the Franks" or Rex Francorum gradually disappeared over the 11th and 12th centuries, replaced by the title King of France, which represented a shift in thinking about the monarchy from that of a Popular monarchy (the leader of a people, sometimes without a defined territory to rule) to that of a monarchy tied to a specific territory. A timeline of Frankish rulers is difficult since the realm was, according to old Germanic practice, frequently divided among the sons of a leader upon his death and then eventually reunited through marriage, treaty, or conquest. Thus, there were often multiple Frankish kings ruling different territories, and divisions of those territories was inconsistent over time. As inheritance traditions changed, the divisions of Francia (a modern historiographical term used to denote the lands of the Franks) became more-or-less permanent kingdoms, West Francia formed the nucleus of what later became the Kingdom of France, East Francia evolved into the Kingdom of Germany, while Middle Francia became the short-lived Kingdom of Lotharingia, which was soon divided up between its neighbors. By the time of the Capetian dynasty, the Frankish rulers became Kings of France, a title formalized when Philip II of France altered the prior form in 1190. In the east, Germany passed from Frankish control in 911 with the election of Conrad I as king. Clovis I united all the Frankish petty kingdoms as well as most of Roman Gaul under his rule, conquering the Domain of Soissons of the Roman general Syagrius as well as the Visigothic Kingdom of Toulouse. He took his seat at Paris, which along with Soissons, Reims, Metz, and Orléans became the chief residences. Upon his death, the kingdom was split among his four sons. Chlothar II defeated Brunhilda and her grandson, reunifying the kingdom. However, in 623, to appease particularistic forces and also secure the borders, he gave the Austrasians his young son as their own king. His son and successor, Dagobert I, emulated this move by appointing a sub-king for Aquitaine, with a seat at Toulouse, in 629 and Austrasia in 634. 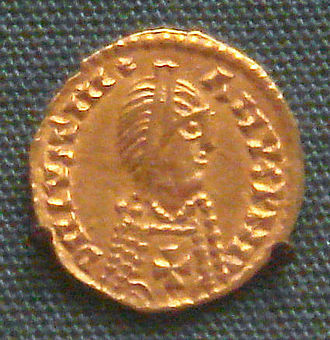 Theuderic III was recognized as king of all the Franks in 679. From then on, the kingdom of the Franks can be treated as a unity again for all but a very brief period of civil war. This is the period of the "idle kings" who were increasingly overshadowed by their mayors of the palace. The Carolingians were initially mayors of the palace under the Merovingian kings, first in Austrasia and later in Neustria and Burgundy. 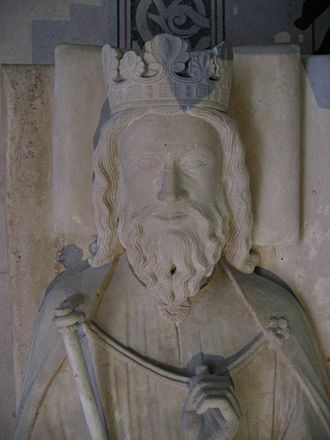 In 687, Pippin of Heristal took the title Duke and Prince of the Franks (dux et princeps Francorum) after his conquest of Neustria in at the Battle of Tertry, which was cited by contemporary chroniclers as the beginning of Pippin's reign. Between 715 and 716, the descendants of Pippin disputed the succession. 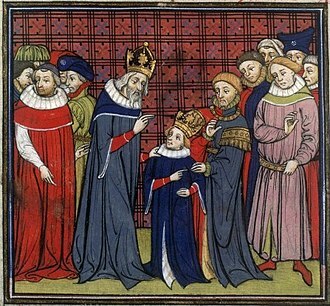 In March 752, Pippin (Pepin) III became the King of the Franks and the office of mayor disappeared. The Carolingians displaced the Merovingians as the ruling dynasty. 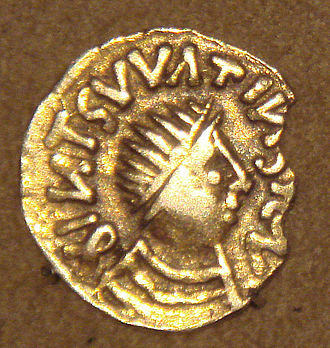 Louis the Pious made many divisions of his empire during his lifetime. The final division, pronounced at Worms in 838, made Charles the Bald heir to the west, including Aquitaine, and Lothair heir to the east, including Italy and excluding Bavaria, which was left for Louis the German. However, following the emperor's death in 840, the empire was plunged into a civil war that lasted three years. The Frankish kingdom was then divided by the Treaty of Verdun in 843. Lothair was allowed to keep his imperial title and his kingdom of Italy, and granted the newly created Kingdom of Middle Francia, a corridor of land stretching from Italy to the North Sea, and including the Low Countries, the Rhineland (including Aachen), Burgundy, and Provence. Charles was confirmed in Aquitaine, where Pepin I's son Pepin II was opposing him, and granted West Francia (modern France), the lands west of Lothair's Kingdom. Louis the German was confirmed in Bavaria and granted East Francia (modern Germany), the lands east of Lothair's kingdom. The following table does not provide a complete listing for some of the various regna of the empire, especially those who were subregna of the Western, Middle, or Eastern kingdom such as Italy, Provence, Neustria, and Aquitaine. Names marked with an asterisk (*) were not Carolingians, but Robertians. After this, the House of Capet ruled France. 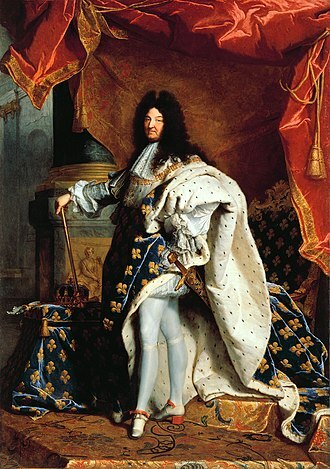 For the continuation, see the list of French monarchs. 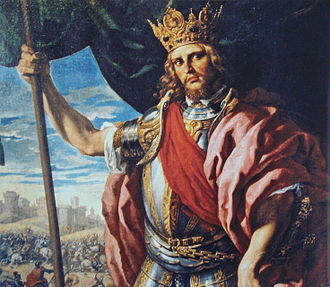 Louis II, 855–875, the eldest son, succeeded his father as Emperor and received Italy. For the continuation, see King of Italy. 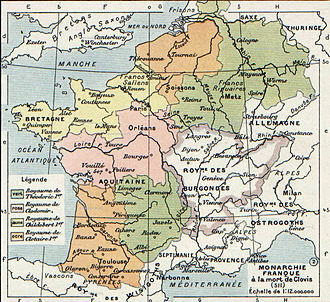 Lothair II, 855–869, the second son, received the northern half of Middle Francia, which came to be named "Lotharingia" (Lorraine) from his name. For the continuation, see the list of rulers of Lorraine. 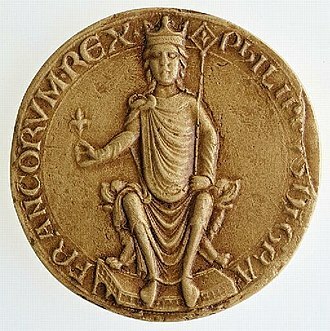 Charles, 855–863, the youngest son, received the southern half of Middle Francia, consisting of Provence and Burgundy. For the continuation, see King of Burgundy. Louis the Child was the last East Frankish Carolingian ruler. He was succeeded by Conrad of Franconia and then the Saxon Ottonian dynasty. 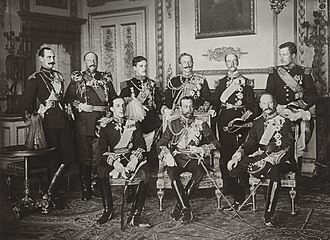 For the continuation, see the list of German monarchs. ^ a b c d e f g h i j k l m William Deans; Frederick Martin (1882). A History Of France: From The Earliest Times To The Present Day. 1. Edinburgh & London: A. Fullarton & Co. pp. 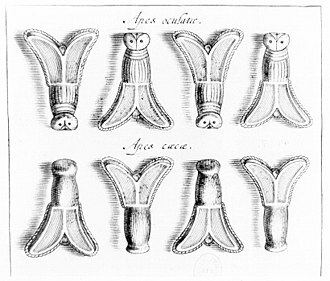 420-1792, Table Of Sovereigns Of France, vi-ix. ^ Paul Oldfield, Sanctity and Pilgrimage in Medieval Southern Italy, 1000-1200, (Cambridge University Press, 2014), 218. ^ McConville 2018, p. 362. ^ a b Bachrach, Bachrach & Leese 2018. ^ Charles Knight, The English Cyclopaedia: Volume IV, (London : 1867); pg 733 "We have no circumstantial account of this important event, except that Pepin was anointed at Soissons, in March 752, by Boniface, bishop of Mainz, called the Apostle of Germany, before the assembly of the nation." The history of France as recounted in the "Grandes Chroniques de France", and particularly in the personal copy produced for King Charles V between 1370 and 1380 that is the saga of the three great dynasties, the Merovingians, Carolingians, and the Capetians, that shaped the institutions and the frontiers of the realm. This document was produced and likely commissioned during the Hundred Years' War, a dynastic struggle between the rulers of France and England with rival claims to the French throne. It should therefore be read and considered carefully as a source, due to the inherent bias in the context of its origins. Medieval France: An Encyclopedia, eds. W. Kibler and G. Zinn. New York: Garland Publishing, 1995. "Merovingian dynasty". Encyclopædia Britannica Online. 2011. Syagrius was the last Roman military commander of the Kingdom of Soissons, a Roman rump state in northern Gaul. His defeat by king Clovis I of the Franks is considered the end of Western Roman rule outside of Italy and he inherited his position from his father, the last Roman magister militum per Gallias. 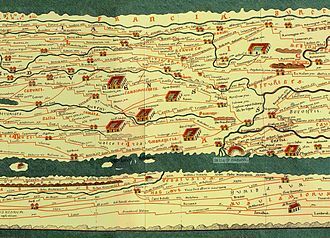 Syagrius governed this Gallo-Roman enclave from the death of his father in 464 until 486, historians have mistrusted the title rex Romanorum that Gregory of Tours gave him, at least as early as Godefroid Kurth, who dismissed it as a gross error in 1893. However, S. Syagrius managed to hold off the neighbouring Salian Franks, however, it is known that Childeric had previously come to the aid of the Gallo-Romans, joining a certain officer named Paul in operations against Saxons who at one point seized Angers. 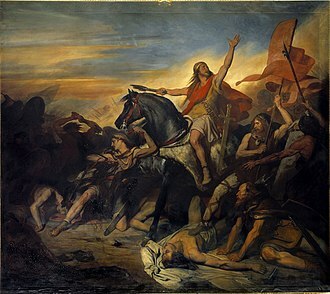 Upon Childerics death in 481 his son Clovis succeeded him, while Childeric had seen no need to overthrow the last Roman foothold in the west, Clovis assembled an army, issued a challenge, and met Syagriuss forces. The treaty signed in Verdun-sur-Meuse ended the three-year Carolingian Civil War. Lothairs brother Louis the German and his half-brother Charles the Bald refused to acknowledge Lothairs suzerainty, each of the three brothers was already established in one kingdom, Lothair in Italy, Louis the German in Bavaria, and Charles the Bald in Aquitaine. 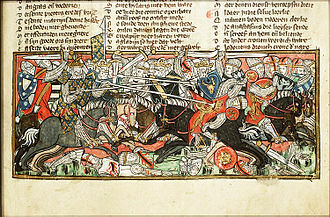 In the settlement, Lothair retained his title as emperor and, Lothair received Middle Francia and his domain became the Low Countries, Alsace, Burgundy and the Kingdom of Italy. 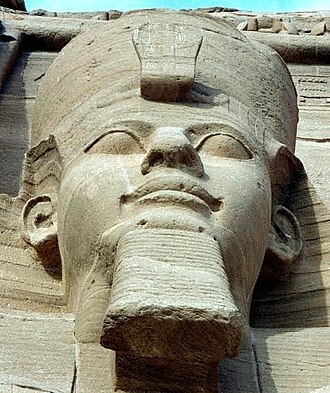 He received the two cities and Rome, and the imperial title, but it conferred only nominal overlordship of his brothers lands. Louis the German received the eastern portion, Charles the Bald received the western portion, which became France. Pepin II was granted the kingdom of Aquitaine, but only under the authority of Charles, Charles received all lands west of the Rhône, which was called West Francia. Lothairs eldest son, Louis II inherited Italy and his fathers claim to the Imperial, the division of the Frankish realm by the Treaty of Verdun, carried out without any regard to linguistic and cultural continuities, resulted in conflicts in Western Europe until the 20th century. Since the Middle Frankish Kingdom combined lengthy and vulnerable borders with poor internal communications as it was severed by the Alps, it was not a viable entity. This made it difficult for a ruler to reassemble Charlemagnes empire. Only Charles the Fat achieved this briefly, in 855, the northern section became fragile Lotharingia, which became disputed by the more powerful states that evolved out of West Francia and East Francia. Generations of kings of France and Germany were unable to establish a rule over Lothair’s kingdom. In 1766, it passed to France after the death of Stanislaw Leszcyznski, in 1871, Alsace-Lorraine became German, after the victory of Prussia and its German allies over the French in the Franco-Prussian War. In 1919, it became French again by the Treaty of Versailles, in 1940, Germany reannexed Alsace-Lorraine following Germanys successful invasion of France. Finally, in 1945, after World War II, Alsace-Lorraine was solidified as French territory, the collapse of the Middle Frankish Kingdom compounded the disunity of the Italian Peninsula, which persisted into the 19th century. Middle Francia was allocated to emperor Lothair I, the eldest son and successor of emperor Louis the Pious. 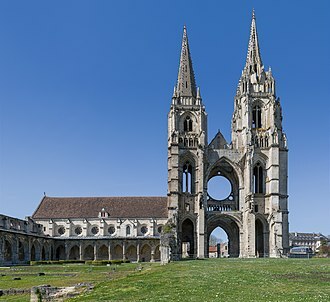 Following the 855 partition, Middle Francia became only a geographic term, in 855, on his deathbed at Prüm Abbey, Emperor Lothair I with the Treaty of Prüm divided Middle Francia among his three sons. The lands in northern Italy, which extended as far south as Rome and Spoleto, were left to the eldest son Louis II the Younger, crowned co-Emperor in 850 and this eventually became the Kingdom of Italy. Charles received Kingdom of Burgundy and Provence, which became the Kingdom of Arles, Charles died early and without sons in 863. According to a Frankish custom, his brothers Louis II and Lothair II divided his realm, Lothair II received the western Lower Burgundian parts which were bordering his western Upper Burgundy which were incorporated into Lotharingia, while Louis II received the Kingdom of Provence. When Lothair II died in 869, his only son Hugh by his mistress Waldrada, was declared illegitimate, so his legal heir was his brother. The Kingdom of Germany or German Kingdom developed out of the eastern half of the former Carolingian Empire. Like Anglo-Saxon England and medieval France, it began as a conglomerate, East Francia was formed by the Treaty of Verdun in 843, and was ruled by the Carolingian dynasty until 911, after which the kingship was elective. The initial electors were the rulers of the duchies, who generally chose one of their own. After 962, when Otto I was crowned emperor, the formed the bulk of the Holy Roman Empire. 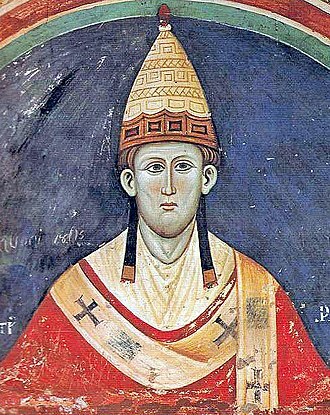 The term rex teutonicorum first came into use in the chancery of Pope Gregory VII during the Investiture Controversy, in the twelfth century, in order to stress the imperial and transnational character of their office, the emperors began to employ the title rex Romanorum on their election. Distinct titulature for Germany and Burgundy, which traditionally had their own courts, there are nevertheless relatively few references to a German realm and an instability in the terms use. The eastern division of the Treaty of Verdun was called the regnum Francorum Orientalium or Francia Orientalis and it was the eastern half of the old Merovingian regnum Austrasiorum. The east Franks themselves were the people of Franconia, which had settled by Franks. Foreign kings and ecclesiastics continued to refer to the regnum Alemanniae, the term regnum Germaniae begins to appear even in German sources at the beginning of the fourteenth century. 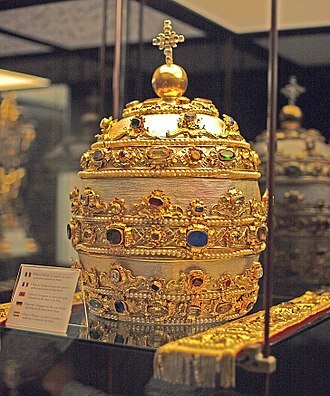 Therefore, throughout the Middle Ages, the convention was that the king of Germany was Emperor of the Romans and his title was royal from his election to his coronation in Rome by the Pope, thereafter, he was emperor. After the death of Frederick II in 1250, the trend toward a clearly conceived German kingdom found no real consolidation. The title of king of the Romans became less and less reserved for the emperor-elect but uncrowned in Rome, the reign was dated to begin either on the day of election or the day of the coronation. The election day became the starting date permanently with Sigismund, Maximilian I changed the style of the emperor in 1508, with papal approval, after his German coronation, his style was Dei gratia Romanorum imperator electus semper augustus. Merovech is the semi-legendary founder of the Merovingian dynasty of the Salian Franks, which became the dominant Frankish tribe. He is said to be one of several barbarian warlords and kings that joined forces with the Roman general Aetius against the Huns under Attila on the Catalaunian fields in Gaul. The first Frankish royal dynasty called themselves Merovingians after him, although no historical evidence exists that Merovech ever lived. It has been suggested that Merovech refers to the Dutch river Merwede and his name is close to Marwig, lit. There is little information about him in the histories of the Franks. Gregory of Tours only names him once as the father of Childeric I while putting doubt on his descent from Chlodio, many admit today that this formulation finds its explanation in a legend reported by Fredegar. The Chronicle of Fredegar interpolated on this reference by Gregory by adding Merovech was the son of the queen, Chlodios wife, but his father was a sea-god, bestea Neptuni. 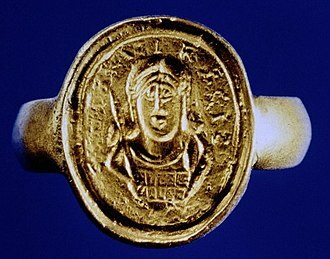 The Salian Franks, called the Salians, were a northwestern subgroup of the early Franks who first appear in the historical records in the third century. They are contrasted with their neighbours to the east, the Ripuarian Franks, at first the Salians lived between the Rhine and the IJssel in the modern day Dutch region of the Veluwe, Gelderland. As the Salians initially lived north of the Rhine delta, they were north of the limes of Roman Gaul. They were characterised as both warlike Germanic people and pirates, shortly thereafter, some were settled permanently on Roman land, and were seen as Laeti. They next settled in Batavia, an island in the Rhine, and in 358, they came to some form of agreement with the Romans. Over time, the Salians fully adopted the Frankish identity and ceased to appear by their name from the 7th century onward. The Merovingian kings responsible for the conquest of Gaul are thought to have had Salian ancestry, the Lex Ripuaria originated about 630 around Cologne and has been described as a development of the Frankish laws known from Lex Salica. From the early 6th century on, the name Salian Franks is used to contrast with the Ripuarian Franks. Salii may have derived from the name of the IJssel river, formerly called Hisloa or Hisla, and in ancient times, today this area is called Salland. Alternatively, the name may derive from a proposed Germanic word *saljon meaning friend or comrade, the Salian Frankish language is ancestral to the modern family of Low Franconian dialects. The Salian tribes constituted a loose confederacy that banded together to negotiate with Roman authority, each tribe consisted of extended family groups centered on a particularly renowned or noble family. The importance of the bond was made clear by the Salic Law. The Salian Franks original proximity to the sea is attested in the first historical records, in about 286 AD, Carausius was put in charge of defending the coasts of the Straits of Dover against Saxon and Frankish pirates. This changed when the Saxons drove them south into Roman territory and their history is attested by Ammianus Marcellinus and Zosimus, who described their migrations toward the southern Netherlands and Belgium. The Alemanni were a confederation of Germanic tribes on the upper Rhine river. In 496, the Alemanni were conquered by Frankish leader Clovis, mentioned as still pagan allies of the Christian Franks, the Alemanni were gradually Christianized during the 7th century. The Pactus Alamannorum is a record of their customary law during this period, until the 8th century, Frankish suzerainty over Alemannia was mostly nominal. But after an uprising by Theudebald, Duke of Alamannia, Carloman executed the Alamannic nobility, during the and weaker years of the Carolingian Empire the Alemannic counts became almost independent, and a struggle for supremacy took place between them and the Bishopric of Constance. According to Asinius Quadratus their name means all men and it indicates that they were a conglomeration drawn from various Germanic tribes. Other sources say the name derives from alahmannen which means men of sanctuary and not all men. The Romans and the Greeks called them as such mentioned and this etymology has remained the standard derivation of the term. Walafrid Strabo, a monk of the Abbey of St, the name of Germany and the German language in several languages is derived from the name of this early Germanic tribal alliance. For details, see Names of Germany, the Alemanni were first mentioned by Cassius Dio describing the campaign of Caracalla in 213. At that time they dwelt in the basin of the Main. Cassius Dio portrays the Alemanni as victims of this treacherous emperor and they had asked for his help, says Dio, but instead he colonized their country, changed their place names and executed their warriors under a pretext of coming to their aid. When he became ill, the Alemanni claimed to have put a hex on him, Caracalla, it was claimed, tried to counter this influence by invoking his ancestral spirits. In retribution Caracalla led the Legio II Traiana Fortis against the Alemanni, the legion was as a result honored with the name Germanica. Not on good terms with Caracalla, Geta had been invited to a reconciliation, at which time he was ambushed by centurions in Caracallas army. Tournai, known in Dutch as Doornik, is a Walloon city and municipality of Belgium located 85 kilometres west-southwest of Brussels, on the river Scheldt, in the province of Hainaut. Tournai is part of the Eurometropolis Lille-Kortrijk-Tournai, which had 2,155,161 residents in 2008, along with Tongeren, Tournai is the oldest city in Belgium and it has played an important role in the countrys cultural history. Tournai is located in the Wallonia region of Belgium, at the limit of the Flemish plain, in the basin of the River Scheldt. 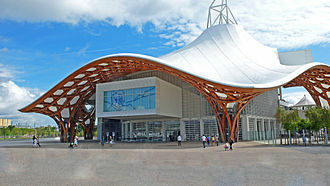 Administratively, the town is part of the Province of Hainaut and it is a municipality that is part of the French-speaking Community of Belgium. Tournai has its own arrondissements, both administrative and judicial and its area of 213.75 square kilometres makes it the largest municipality in size in Belgium, it is the largest in population in Western Hainaut. Rocks from the Tournai area date from the Carboniferous Period and have used to define the Tournaisian Age. Tournai stone is a limestone which takes a polish and was used particularly in the Romanesque period for sculpted items such as Tournai fonts. It is enough to have been used locally for pavements. It is sometimes called Tournai marble, though this is geologically inaccurate, known as Tornacum, was a place of minor importance in Roman times, a stopping place where the Roman road from Cologne on the Rhine to Boulogne on the coast crossed the river Scheldt. It was fortified under Maximian in the 3rd century AD, when the Roman limes was withdrawn to the string of outposts along the road and it came into the possession of the Salian Franks in 432. Under king Childeric I, whose tomb was discovered there in 1653, in 486, Clovis moved the center of power to Paris. In turn, a son of Tournai, became bishop of the newly created bishopric of Tournai. 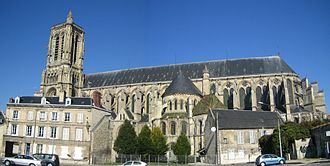 In 862 Charles the Bald, first king of Western Francia and still to become Holy Roman Emperor, after the partition of the Frankish empire by the Treaties of Verdun and of Meerssen, Tournai remained in the western part of the empire, which in 987 became France. The construction of Aachen, illumination by Jean Fouquet, in the Grandes Chroniques de France, 15th century. Charlemagne is at the foreground. Carolingian Empire and its capital, Aachen, in the early 9th century. The Limes Germanicus 83 to 260 CE. 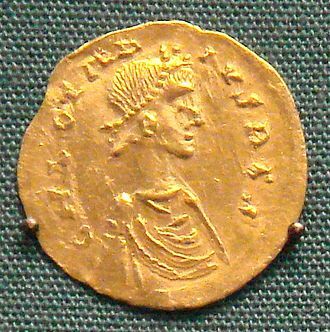 The gold bracteate of Pliezhausen (6th or 7th century) shows typical iconography of the pagan period. The bracteate depicts the "horse-stabber underhoof" scene, a supine warrior stabbing a horse while it runs over him. The scene is adapted from Roman era gravestones of the region. The ruins of the Abbey of St Jean des Vignes. Northern Gaul "sou", 440-450, 4240 mg. The Vachères warrior, 1st century BC, a statue depicting a Romanized Gaulish warrior wearing chainmail and a Celtic torc around his neck, wielding a Celtic-style shield. The Oktoberfest in Munich, the most widely-known festival of Bavarian culture, held since 1810 (2006 photograph). Caricature of four "Munich types" (Münchner Charakterköpfe): Highlander (Der Wastl aus dem Oberland "Wastl from the Oberland"), clerk (Gerichtsschreiber "court secretary"), shirker (Invalid in Friedenszeiten "peacetime-invalid"), petty bourgeois (Münchner Hausvater "Munich pater familias"), Julius Adam, Die Gartenlaube (1875). 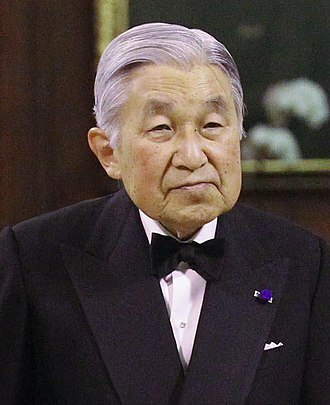 Emperor Akihito is the hereditary monarch of Japan.The Japanese monarchy is the oldest continuous hereditary monarchy in the world. 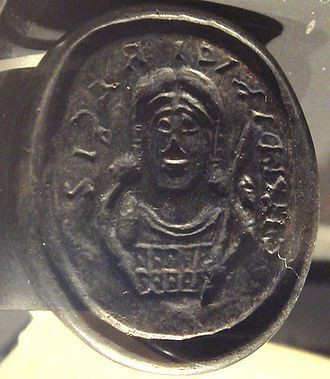 13th century depiction of Basina and Childeric I.
Salian settlement in Toxandria, where they had recently settled or been settled in 358, when Julian the Apostate made them dediticii. 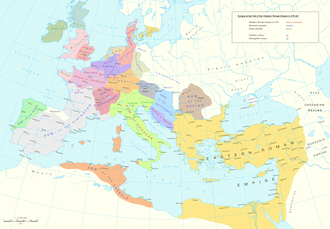 Europe at the fall of the Western Roman Empire in 476 AD.